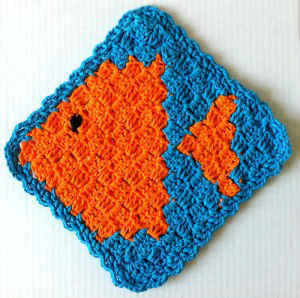 Designer Kathleen Stuart wrote: “Continuing with the idea of the diagonal blocks, I made the fish dishcloth. The fish dishcloth is a block from an afghan I designed several years ago – Fish Afghan found in Donna Kooler’s Crocheted Afghans. This dishcloth has an added border that look like ripples on the water. I used the orange yarn because my grandson likes the movie Finding Nemo and it reminds me of Nemo. I hope you enjoy it. 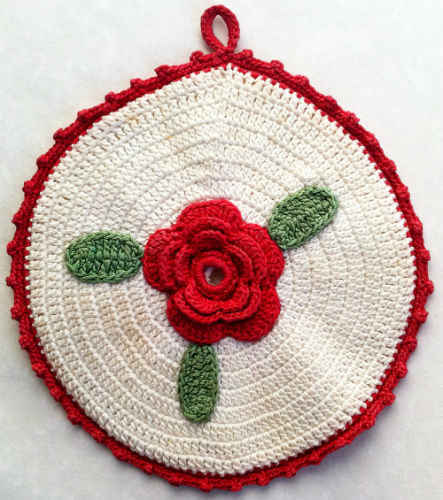 Thank you Kathleen for designing another fantastic dischloth for the Dishcloth-a-Day Challenge. Beginning Block (beg-block): Ch 5, turn; 3 dc in fourth ch from hook. Block: Sl st in ch-3 sp of next block, ch 3, 3 dc in same sp. 1. Dishcloth is worked diagonally, from corner to corner. 2. When changing colors, keep unused color to wrong side of work; do not cut yarn until color is no longer needed. Do not carry colors on wrong side of work, unless otherwise noted; use a separate skein or ball for each color change. The dishcloth requires 2 balls of Blue and 1 ball of Orange. Row 1: (Right Side) Starting at tip of head, with Orange, ch 5, 3 dc in 5th ch from hook (first block made). Row 19: Turn; sl st in first 3 dc and in first ch-3 sp, ch 3, 3 dc in same sp, sl st in ch-3 sp of last block. (1 Block) DO NOT FINISH OFF. Rnd 1: Ch 1, sc in same sp as sl st, * [ch 3, sc in between next 2 blocks on side] across side of square, [sc, ch 1, sc] in corner st; rep from * across each side of block, ending with ch 3; join with sl st to first sc. Rnd 2: Sl st to ch-3 sp, ch 1, [(sc, ch 2, dc) in next ch 3 space] around; join with sl st to first sc. Finish off and weave in ends. – Using Black, embroider eye with satin stitch on 2nd Block of Row 5. Hi Maggie, Love these patterns….was going to enter one myself, but find myself working so much and just too tired to start…but hopefully after the holidays would love to work on one. Love these last two very much but was wondering if Kathleen, would work on one with a bear.. My mascot of high school was a polar bear, and we are coming up with an all school reunion, and we have silent autions. 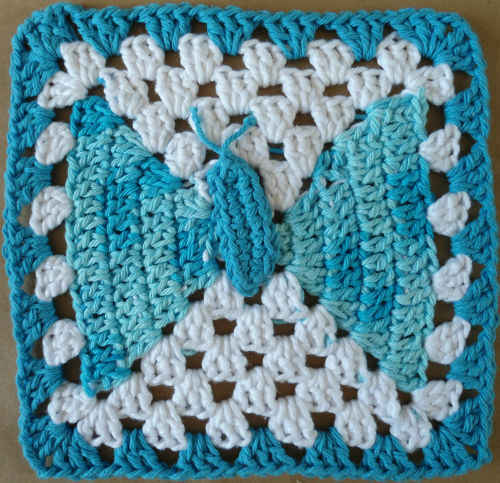 I have been crocheting some of these patterns, and an afgan and pot holders, and coasters to add to the basket my class is putting together. Would love to crochet one with a bear…. Help, I love this pattern. Wanted to make it for my grandson, but having trouble following the pattern. Can any one help me?